The Bonn-Cologne Graduate School for Physics and Astronomy BCGS is a joint program of graduate studies between the universities of Bonn and Cologne. The program leads students with a bachelor's degree through an MSc phase to doctoral studies. Students with MSc degrees are admitted directly to the PhD stage. The BCGS provides mentoring and research internships, scholarships and travel funds, and a vibrant research environment at the forefront of modern physics. 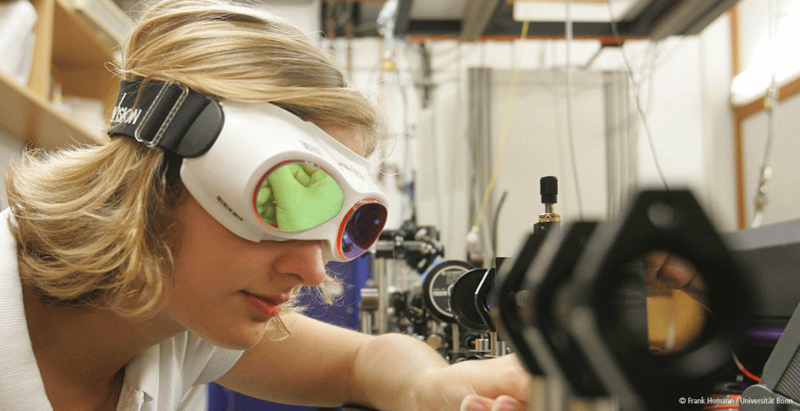 Research areas at the two departments of Bonn and Cologne span almost the entire range of current physics; from astrophysics, biophysics and condensed matter research to particle physics, quantum optics and string theory. Since 2007, the BCGS has been funded through the Excellence Initiative of the German Federal Ministry of Education and Research and the German Research Foundation. 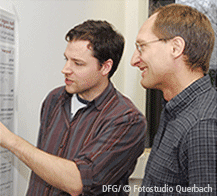 The Bonn-Cologne Graduate School of Physics and Astronomy runs a 5-year integrated program spanning the two years of MSc studies and three years for the PhD. Students holding already an MSc or equivalent can join directly at the PhD stage. All BCGS events and opportunities such travel grants are open to all physics graduate students (MSc and PhD) at Bonn and Cologne. The so-called honors branch of the BCGS provides scholarships and additional mentoring on a competitive basis. 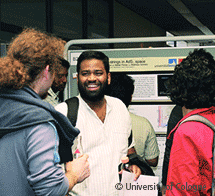 We encourage students to broaden their scientific horizons, not only during the MSc phase but also during PhD studies. To this end, the BCGS organizes advanced lecture courses on a broad range of topics, see Teaching. We aim to expose students to current research at an early stage of their careers. 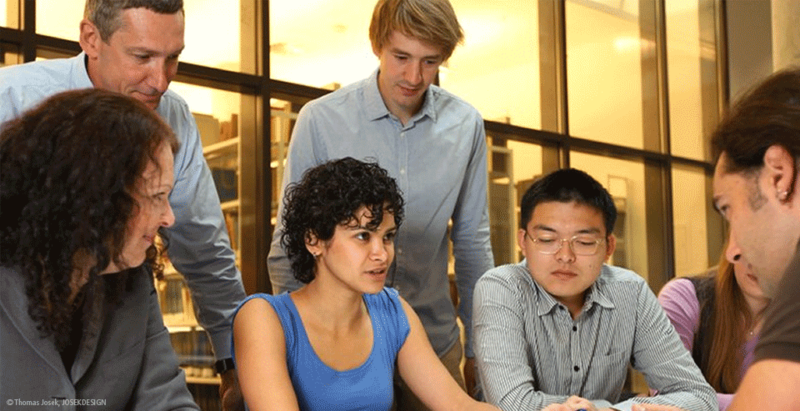 Already our first-year students are integrated into research groups through research internships. Our students are part of a community of young talented researchers and we want them to feel comfortable in that community. Introduction events help new students to settle in, and networking events encourage ties between BCGS students and faculty. An example is the successful series of talks "Science Meets Business". The Master programs provides a thorough research-oriented scientific education. Aim is to equip students with advanced scientific tools and the experience to apply them with independence, responsibility, and reflection. The two-year Master courses are modularly structured and comprises both lecture courses and thesis work. The language of instruction is English. 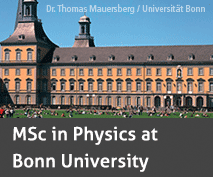 To join the BCGS for a Master course (that is with a Bachelor's degree in Physics or equivalent), students enrol at either Bonn or Cologne University. The choice is largely determined by individual research interests. Nevertheless, students may attend courses at either university and are encouraged to do so. The specialization fields offered in this course lie in hadron physics, particle and astroparticle physics, photonics, condensed matter physics, and mathematical physics. Further details can be found here. 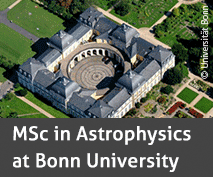 As one of the few universities in Germany, Bonn has introduced a program of Master of Science in Astrophysics. Further details can be found here. The specialization fields in Cologne include general relativity, quantum field theory, astrophysics, nuclear physics, condensed matter physics experiment and theory, and statistical and biological physics. Further details can be found here. To illustrate the benefits of the combined offers of both departments, we have prepared several sample curricula. To begin PhD studies, an MSc degree (or equivalent) is required, and candidates need to find a suitable supervisor and research project. During the MSc phase there is ample opportunity for this (for instance through research internships), nevertheless it is also possible to go directly to PhD studies with an MSc degree in physics or a related field taken outside the BCGS. Comparing the BCGS program with the Anglo-Saxon system, the coursework component of a PhD in the US or UK roughly corresponds to our Master program, the research component corresponds to our PhD. PhD students are usually paid a salary and contribute to teaching at the undergraduate or Master level, by leading tutorial (problem solving) sessions, and/or by devising homework problems. Early on in the PhD, a thesis committee is formed from faculty members of both universities to provide mentoring and give advice. During the first two years of PhD studies, students are encouraged to attend further advanced classes on special topics. Our students also have the opportunity to attend national or international research schools and, in the later stages of their work, workshops and conferences. As a further element of the graduate school, we strongly encourage a stay abroad for at least some months during the PhD phase. The research done is documented in a PhD thesis, which is refereed by at least two faculty members. Together with an oral disputation, this constitutes the formal requirement for obtaining a PhD. In the framework of the honors branch, the BCGS offers a number of MSc scholarships, available on a competitive basis. Interviews for MSc scholarships in the framework of the BCGS honors branch take place every year in spring, when shortlisted candidates are invited to Bonn and Cologne (see here for details). The lecture coursework for members of the honors branch is identical to the regular MSc program. However, honors branch students are expected to perform at least one research internship. For details about the application procedure and the selection process, see here. All BCGS students can apply for student allowances (e.g. travel funds to attend summer schools or conferences), please contact your local BCGS office for details. All relevant forms can be found in the download area. 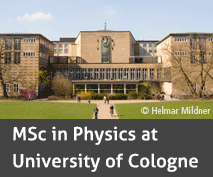 The physics departments in Bonn and Cologne focus on different research areas; between them they span almost the full range of modern physics. Bonn focusses on particle physics (both experiment and theory), condensed matter and photonics, and astronomy/astrophysics. The department runs its own electron accelerator (ELSA) and a cyclotron. In Cologne, research is on astrophysics and cosmology, condensed matter and statistical physics, biophysics, and experimental nuclear physics using an in-house tandem accelerator. One of the particular strengths of Cologne physics is theoretical research in condensed matter and statistical physics. 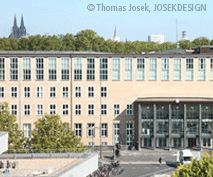 For full information, please see the departmental homepages of Bonn and Cologne. Both departments are also engaged in ongoing collaborations with international research groups worldwide. 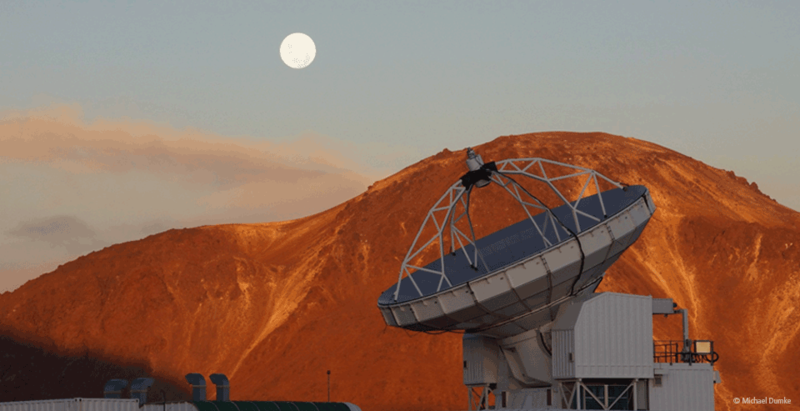 There exist research links and collaborations both in nuclear and hadron physics and in condensed matter physics with the Forschungszentrum Jülich and in astronomy/astrophysics with the Max-Planck Institute for Radio Astronomy. 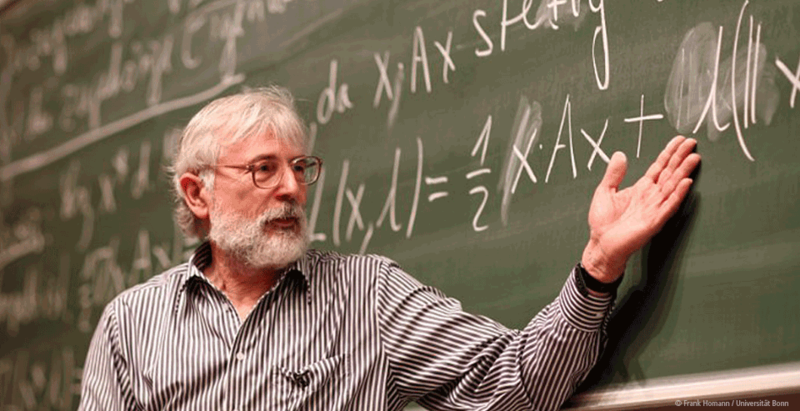 Every term the two physics departments offer advanced lecture courses. These courses are timed so that they can be attended by students from both Bonn and Cologne. 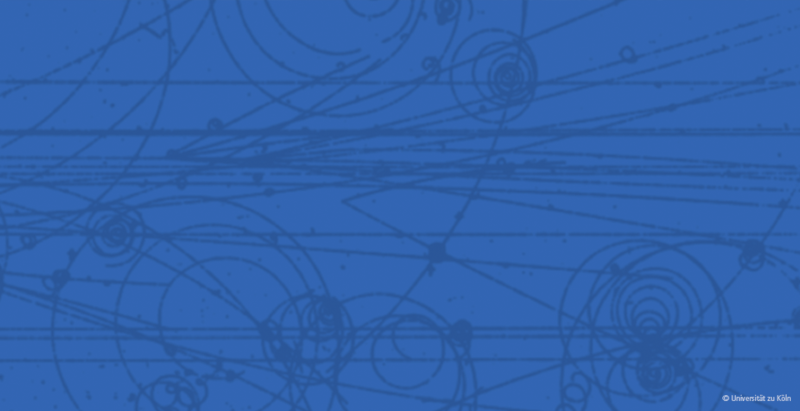 All BCGS events are open to all physics graduate students from Bonn and Cologne. 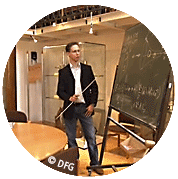 The complete list of physics lecture courses at Bonn University can be found here. The complete list of physics/astronomy courses at Cologne University with comments can be found here. A list of courses from past years can be accessed here. During the semester breaks, the BCGS runs topical courses of one week's duration, with lectures, guest speakers and laboratory sessions. These intensive weeks are an excellent opportunity to learn in depth about current research before committing to a topic for a thesis. A comprehensive list of past and current topics can be found here. Research internships are a key element of our effort to get BCGS students involved in research early on. As research interns, students join a research group to undertake a research project of typically four weeks duration. This also helps to choose an MSc project. Participation in at least one research internship is recommended for all BCGS members. Please note that these internships are aimed at students which are already part of the BCGS, scholarships to support internships for external students are not available. 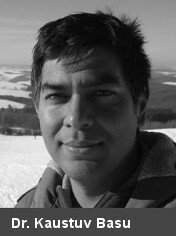 Observational & astrophysical cosmology Current research focus: Investigating dark energy and dark matter with galaxy clusters, astrophysics of galaxy clusters, radio astronomy techniques. Numerical investigation of correlated fermions and bosons; impurity effects in condensed matter. 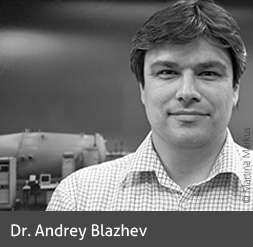 Broadband dielectric spectroscopy (from mHz to THz); dynamics of complex quantum matter. Institute of Nuclear PhysicsCurrent research focus: Nuclear structure studies by prompt and delayed particle and gamma spectroscopy for testing and improving nuclear models. To illustrate the benefits of the combined offers of both departments, we have prepared several example curricula. Below is a list of physics summer schools in Germany and beyond. 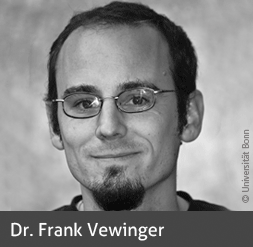 If you know of a summer school not listed here please contact Frank Vewinger (photonics), Eckhard v. Toerne (HEP), Andrey Blazhev (nuclear physics), Joachim Hemberger (condensed matter) or Petra Neubauer-Guenther (astrophysics). living in Bonn or Cologne. The BCGS offers a number of full scholarships (700 EUR per month) for the first year in the framework of the honors branch. In the second year of their Masters studies, MSc students are usually given a side job as teaching assistants. The gross income is about 700 EUR (ca. 600 Euro net), in return students teach, for example, a tutorial class or lab class. 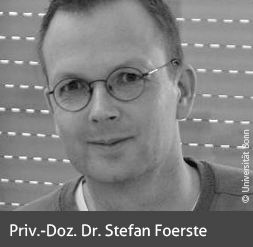 During their PhD phase almost all students hold a research assistant position financed by their research group. The salary is according to the German public employee rules, i.e. usually one half of E13 TV-L, corresponding to a net income of about 1100 Euro. Candidates who apply for direct admission as PhD students should contact potential supervisors prior to their application to discuss the possibilities of obtaining a PhD position. For MSc and PhD students with children, the amount of the financial support can be increased by an allowance for childcare. In addition, the BCGS finances travel and other costs for all BCGS students upon application, please contact your local BCGS office for details. All relevant forms can be found in the download area. Most students in Germany either live in a hall of residence or rent an apartment. A popular option is to share a flat with other students. Both in Bonn and Cologne, student dorms are run by the local student services organisation (Studentenwerk). Rent is 190 to 350 Euros (Bonn) or 140 to 320 Euros per month (Cologne) for a single-occupancy dormitory. Total costs of living in the Bonn / Cologne area amount to approximately 700 EUR per month. You can find further information about student housing on the web sites of the Bonn Studentenwerk (in German only) and Cologne Studentenwerk (in German only). 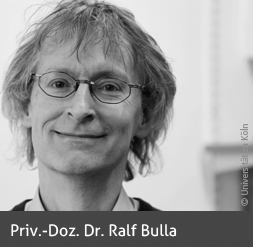 The Cologne Institute for Theoretical Physics maintains pages concerning practical matters of life in Cologne. 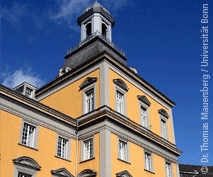 There are no tuition fees at the universities of Bonn and Cologne. The enrolment fees, which are due at the beginning of every term, amount to about 550 EUR per year. In return students receive free public transport in North Rhine-Westphalia and can participate in their university's sport societies. Health insurance and other social benefits come automatically with employment as teaching assistant (PhD and MSc Students). The costs are deducted from the gross salary. They have been taken into account in the net numbers given above. The language of instruction is English. 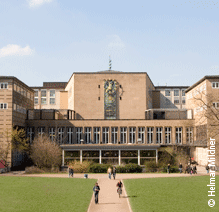 Both Bonn and Cologne universities offer German classes at different levels. The BCGS provides financial support for one of these courses. Please contact your local BCGS office for details. 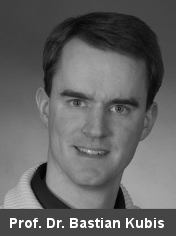 The BCGS spokespersons are I. Brock (Bonn) and J. Berg (Cologne). U. Blum, P. Neubauer-Guenther (coordinators) as well as A. Lezeik and Z. Modak (students). Every year, the BCGS students elect a student council, whose members organize social events, are available to give advice and take suggestions on all aspects of the BCGS. The current members of the BCGS student council are: Ziad Modak (MSc, Bonn; student representative), Ali Lezeik (MSc, Cologne; student representative), Luis Aizpuru (MSc, Bonn), Georgios Giakoustidis (MSc, Bonn), Leonardo Rydin Gorjao (PhD, Cologne), and Jana Schneeloch (MSc, Cologne). S. Trebst, S. Walch, and A. Zilges. The BCGS offices in Bonn and Cologne ensure the smooth running of the graduate school and lend a sympathetic ear and a helping hand to students. 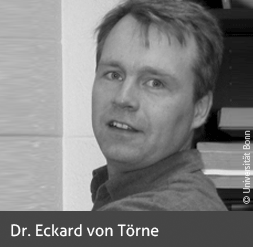 Coordinators are Dr. Ulrich Blum in Bonn and Dr. Petra Neubauer-Guenther in Cologne. Bonn is not only a beautiful historic city located on the banks of the river Rhine and the birthplace of the composer Ludwig van Beethoven, but also offers a vibrant and engaging environment in which to live, work, and study. As the former seat of government, it still houses various governmental institutions, about a dozen United Nations agencies, and 170 other international organisations. Furthermore, Bonn is also home to major corporations such as Deutsche Telekom, T-mobile International and Deutsche Post. 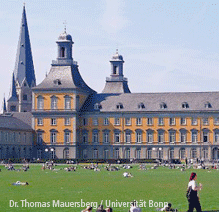 The University of Bonn was founded almost 200 years ago and today is considered one of Germany's most important institutions of higher education. Numerous projects that are being funded and have been funded by Germany's central research funding agency (DFG) clearly demonstrate Bonn's excellence in research. Awards and distinctions contribute to the distinguished reputation of the University of Bonn. The most famous examples of such awards were the Nobel Prizes awarded in 1989 and 1994 to Wolfgang Paul and Reinhard Selten respectively. 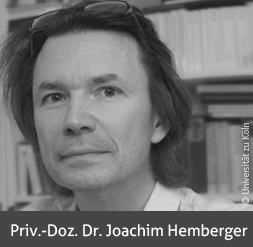 In addition, Bonn can to date boast eight winners of the prestigious Leibniz prize. Located at the crossing of Roman and medieval trade routes and the river Rhine, Cologne has always been a multicultural city. As one of the cultural centres of Europe, Cologne has innumerable museums, art exhibitions, theatres, cultural events and pubs. Cologne's "Karneval" is famous worldwide. Open, friendly and internationally-minded, Cologne is a great place to live, work and study. The University of Cologne is one of the largest German universities and also one of the oldest with its 625th birthday celebrated in 2013. An internet survey conducted in 2013 found Cologne to be the German city and university most popular with international students. The German Excellence Initiative aims to identify and support excellent German universities. In 2012 the University of Cologne was awarded the status of "Exzellenzuniversität", which it holds along with the universities of Heidelberg, Tübingen, Berlin, and Munich among others. 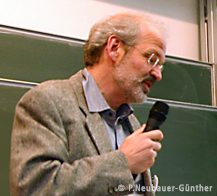 The numerous research projects funded by the German Research Foundation and the European Union at the University of Cologne also underline its reputation on an international level. 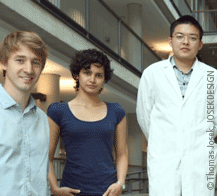 Students who expect challenges in research and teaching will find an optimal setting, especially as the University of Cologne offers a vast range of courses and subjects to choose from. Cologne and its environs are home to three major research institutes (the Nuclear Research Centre in Jülich, the German Aerospace Center in Porz, and the Society for Mathematics and Data Processing in St. Augustin), as well as to four Max Planck Institutes. With a Bachelor degree or equivalent in Physics, you can join the BCGS for a Master course, and subsequently a PhD. Students holding a Master's degree already can join directly for the PhD stage. In either case you need to make a decision whether to apply for the Master's/PhD at Bonn or at Cologne University, a decision that depends on your research interests, see BCGS research. Lecture courses at both institutions are open to BCGS members, and you can switch institutions between the Master's and the PhD. Within the honors branch, the BCGS offers full scholarships for about 30 Master's students per year. For details, please visit the honors branch section; application details can be found here. Teaching staff and lists of all members can be found here. The Department of Physics at Cologne University consists of five physics institutes. For teaching staff please look at the department’s website.